KUCHING: Parti Rakyat Sarawak (PRS) agrees with the Pakatan Harapan (PH) government’s all out move to go after the corrupt in the country, said its president Tan Sri Datuk Amar Dr James Jemut Masing. However, he wanted the PH government to be fair and not harbour the thought of selective persecution. “PH must also go after their own leaders if they are corrupt too. 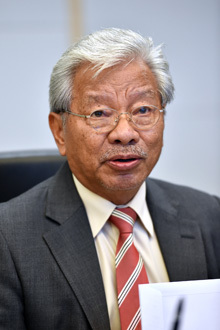 Let the law take its course but there must not be selective persecution,” Masing told a press conference at the party headquarters in Jalan Wan Alwi here today. Salang, who failed to retain Julau parliamentary seat for the Barisan Nasional (BN) in the May 9 polls, urged the PH government led by the fourth and seventh Prime Minister, Tun Dr Mahathir Mohammad, to put relevant laws into action. “Pakatan Harapan is to put laws into action. We let that be as we are all prepared for it. But let there be no perception of selective persecution,” he said on PH’s move to wipe out corruption in the nation.